CotswoldPhoto has released a new reflex-folding light stand, the CLS65 - with a similar design to the Manfrotto 5001B Nano and LumoPro LP604 - for under £28. Ebay (UK) seller CotswoldPhoto has released a new reflex-folding light stand, the CLS65, with a similar design to the Manfrotto 5001B Nano and LumoPro LP604. The new stand is listed for under £28 (even cheaper if you buy 2 or 3). Click here for the eBay listings. 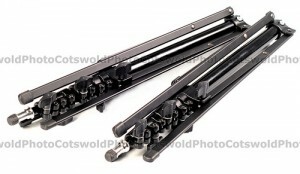 These compact stands are made specially for Cotswold Photo, and are similar in quality, construction, design and function to the Bogen/Manfrotto 5001b (3373/001b) and LumoPro LP604 stands. The tube sections and legs are made of Aluminium, with a total 5 sections (4 of which are risers) to make it really compact when packed away. The retractable legs fold in to make it one of the most compact stands of its height. At the top of stand is the standard spigot/stud, made from hardened chrome steel. An ideal stand to support lighter weight kits on location (up to 2kgs load; note that this weight is quoted for stability purposes – where the stand is secured, for example with suitable weights, a higher load is permissible).